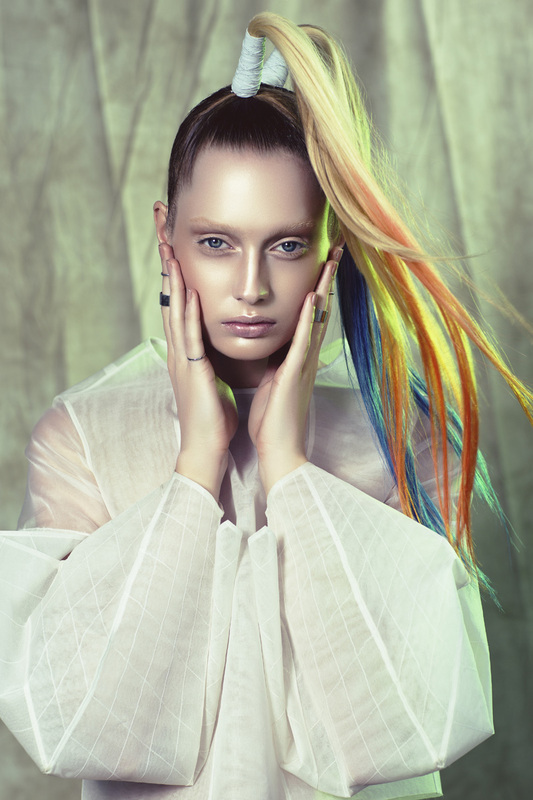 Nathan Yazbek entered the Australian Hair Expo awards in the category of Emerging Hairdresser of the Year. The category is for growing, dynamic achievers in the hairdressing industry who have made a significant impact to their business. "A futuristic feel is presented for this photo shoot after visiting Minneapolis in October 2013 for Aveda Congress . As a result of this travel, I wanted to create a photo shoot that captured the essence of a Futuristic Utopian Metropolis. In this Futuristic Utopian Metropolis lives my “Green Maidens”. They are sustainable and awakened. They are ecological, inspired by their surroundings. Their futuristic hairstyles are not a reference to a bleak future of death and destruction, but a future that is clean, natural, and resourceful. Muted colours of moss green, ice blue and baby pink are the colour palates for my photo shoot. Soft movement and texture with clean lines create a pure, fresh futuristic feel for the hair. All elements within the photo shoot represent a futuristic interpretation, touched with harmony."